A superb night of Rock Covers courtesy of West Lothian's FLASHBACK. It's £3@door (Free Entry B4 8.30pm). Get down sharp. 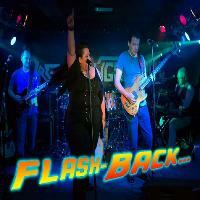 West Lothian's very own FLASHBACK....are back. So does that mean they have they already flashed back or still to Flash forward......All we know they will be Rocking Dreadnoughtrock with a great mix of Covers for you once more. I'll leave you all to work out the theory of time travel if you want. Rock Club action straight after the live session just like ANY OTHER Friday or Saturday till 3am. It's £3@door for the live session BUT IT'S FREE ENTRY B4 8.30pm so get in early and save a few quid.